Which Alfa Romeo would you like to optimise? Check out the power your Alfa Romeo could produce. RaceChip chip tuning is specially customised to the applicable fuel injection technology with respect to both hardware and software. If your vehicle is specified in the list of applicable models below (all other 2.0 TDI models feature just one type of technology), it is important to determine, before choosing a tuning product, which type of injection technology is installed in your vehicle. For such models, you will therefore find the “CR” or “PD” designation after your engine code. New – conveniently control the RaceChip XLR via app. Set your car’s throttle response using your smartphone and the RaceChip app. Is your mobile phone compatible? The Ultimate software, which is specially designed for your vehicle, optimises your engine's electronic signals. In this way, your vehicle's available power reserves are utilised optimally. Feel for yourself more power, dynamics and drive. You won't recognise your car! With the Ultimate you can increase your power considerably and save fuel and money. Up to one litre less fuel per 100 kilometres is possible. Torque optimisation is the key to this success. The equation is pretty simple: more torque = earlier upshifting = less fuel consumption = lower costs. 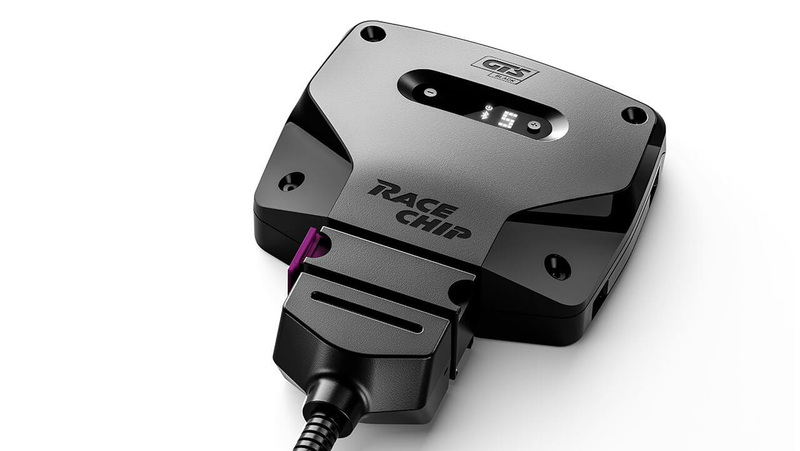 Experience a whole new level of chip tuning with RaceChip Ultimate Connect. With this innovation from RaceChip you can activate various performance optimisation levels via your smartphone along with a long list of other benefits. More under RaceChip app. We deliver our Ultimate with an optimisation that is specially tailored to your engine. If you want a fine adjustment of the power enhancement, however, with the Ultimate you can manually adjust the exact characteristics of your desired power enhancement so that it perfectly suits your needs. Of course, the Ultimate also has all the other qualities that distinguish RaceChip. The optimisation software has undergone a series of examinations and test runs specifically for your engine. Our Engine Protect System Plus ensures that the increased power is always used only within your engine's RPM tolerance range. Naturally, we only use the highest quality components. Irresistible drive on long stretches, dynamic acceleration round bends: if that's what you like, then you'll love our best-seller, the Race Chip Pro 2. Experience your vehicle in a more intense and emotional way at all RPM levels with clearly optimised power and more torque. Benefit in certain situations from more active safety with greater power reserves. The software in the Pro 2 is specially designed for your vehicle to optimise your engine's electronic signals. This provides a significant boost to your horsepower and torque within the available power reserves. You'll feel the added power, dynamics and drive. With RaceChip Pro 2 you can increase power while also saving fuel and money. Up to one litre less fuel per 100 kilometres is possible. Torque optimisation is the key to this simple equation: more torque = earlier upshifting = less fuel consumption = lower costs. The Pro 2 also has other qualities that distinguish RaceChip. The optimisation software is fine-tuned specifically for your engine through a series of examinations and test runs. Our Engine Protect System ensures that the performance improvement is always kept within your engine's RPM tolerance range. Of course, we also use only the highest quality hardware components. You'll get these premium hardware components with the RaceChip Pro 2 together with the latest version of the RaceChip optimisation software at an attractive price and great value. Optimally utilise your power reserves and make absolutely no compromises. The One software, specially designed for your vehicle, optimises your engine's electronic signals. You'll get a considerable boost in horsepower and torque within the available power reserves. You'll feel more power, dynamics and drive. You'll not only optimise your power with RaceChip One, you'll also save fuel and money. You can reduce fuel consumption by up to 1l/100 kilometres. Torque optimisation is RaceChip's key for a simple equation: more torque = earlier upshifting = less fuel consumption = lower costs. We are 100% certain of the quality of our Racechip One. You can benefit from the optional RaceChip engine warranty. For just N/A GBP you'll get one year of additional, comprehensive security for your car. In the unlikely event of damage, RaceChip will stand behind you. This means you're always on the safe side. The One has many of the other quality features typical of RaceChip. The optimisation software is specially designed for your vehicle through a series of examinations and test runs. Our Engine Protect System Plus ensures that the increased power is always used only within your engine's RPM tolerance range. And of course, we only use high-quality hardware components. We are 100% certain of the quality of our products. You'll benefit from the RaceChip engine warranty (optional for the One but including with the Pro 2 for 1 year and for 2 years with the Ultimate ). For just N/A GBP you'll insure your vehicle for an extra year. In the unlikely case of damage, RaceChip will stand behind you. The RaceChip app lets you set up your car as you want; just select the tuning stage from your smartphone. The app can also deactivate the RaceChip, returning the car to stock tune. App control for your RaceChip is available for just N/A GBP. You can download and get to know the RaceChip app for free. With RaceChip, you can utilize this amazing extra function for just na GBP.